A look at Saturday's action. BROOMFIELD, Colo. — Heat, uneven attendance, and first-tournament-of-the-season jitters combined to upend the pre-tournament seedings in the Men’s Division at the Pro-Elite Challenge today. As the temperature notched a 20-degree increase from the first to the third round of play today, Pools A-C were all won by the two-seed1 and Pittsburgh Temper, Pool D’s original four-seed, notched a perfect 3-0 day to get a well-deserved bye to the quarterfinal round. The Championship Bracket for the 2018 Pro-Elite Challenge (Men’s). As you’ll see, the prequarters games are still in progress. Lightning delays persisted long enough this afternoon to force a suspension of play, so they will pick up at 7:45 AM tomorrow morning. 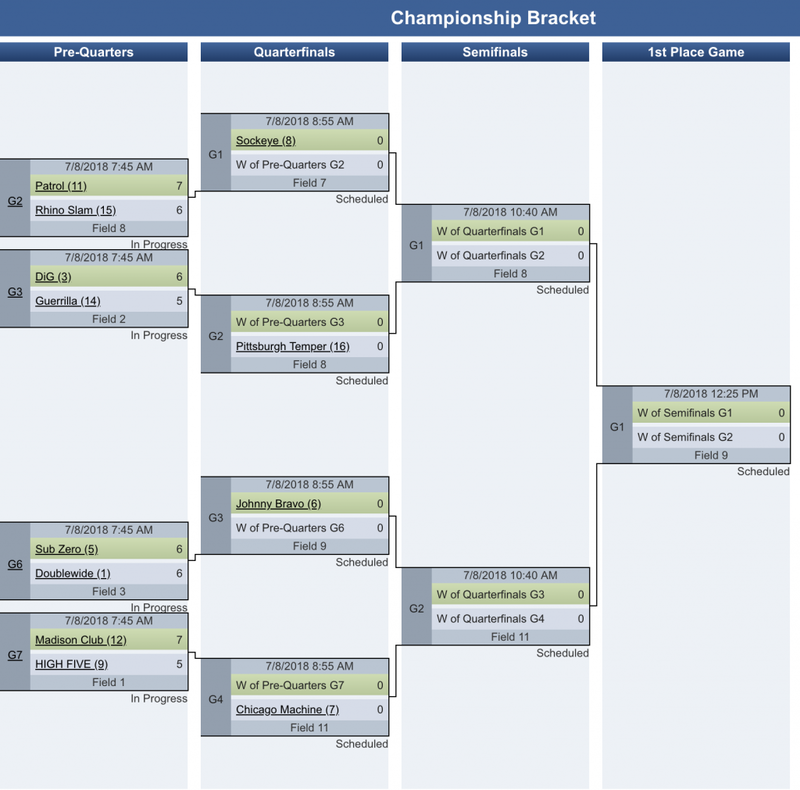 Seattle Sockeye headlined men’s division pool play today with blazing fast offense and smart matchup defense. The roster on paper might be the most talented group of names in competition this weekend, but there were demons of 2017 Nationals to exorcise today and Seattle made sure to check that ritual off the list. Their third win of the day, a tight and controlled 13-11 defeat of Austin Doublewide, will stand out the most on Saturday’s ledger. Dylan Freechild and Jacob Janin, both in their second season with Sockeye, were on fire today. Both have a top gear that was unmatched by any opposing defender or defensive scheme and their dynamism opened up the field for other contributors. Pittsburgh Temper upended Pool D with three strong wins against Minneapolis Sub Zero, New York PoNY, and Michigan High Five. Pat Earles was excellent downfield for the offense and a healthy Tyler DiGirolamo was simultaneously a welcome sight for teammates and a concern at all times for opponents. Temper’s effort Saturday stood out for its consistency. They showed few moments of weakness, played clean, and never wavered under pressure in their games. That hard work not only earned them a bye to quarterfinals—it also hinted at the promise of topping a Mid-Atlantic region that feels more wide open this season than any year since the Pittsburgh merger. Meanwhile, Washington D.C. Truck Stop (1-2) and PoNY (0-3), both originally seeded atop their respective pools, were knocked out of bracket contention after rough starts. After securing a double game point win over Chicago Machine (who had already secured the bye to quarterfinals), Truck Stop head coach Darryl Stanley admitted that no result could’ve surprised him today. “I was prepared for one through four,” he said. The dry Colorado heat was amplified to the day’s greatest intensity during Truck’s ugly but effective 11-10 win over Chicago Machine (after Machine had clinched the top of the pool). As has become typical for teams coached by Stanley, Truck’s lines continued to play as hard as they could regardless of the score. That paid dividends with a win over a Machine team that had otherwise easily dispatched their opponents during pool play. Still, Truck has a long road ahead of them this season. We’ll have more on them in the full tournament recap. 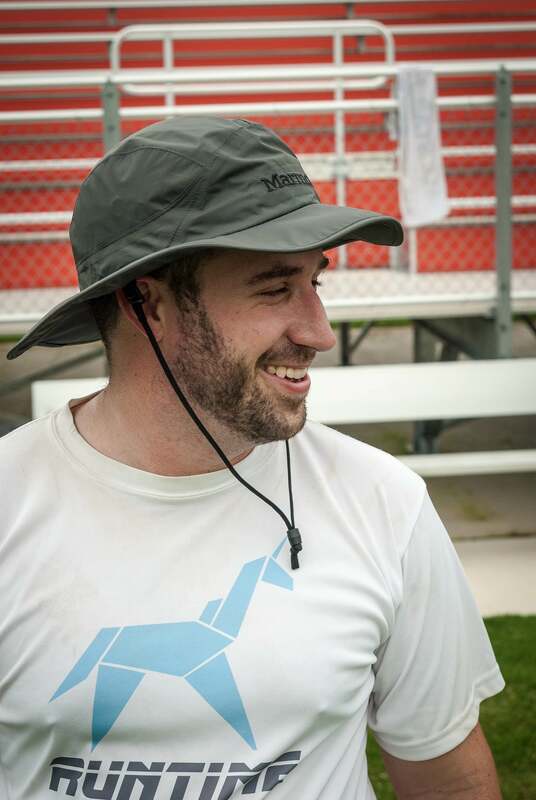 For PoNY, here in Broomfield with only 21 players—and without Chris Kocher, Jimmy Mickle, and others committed to play with the AUDL’s New York Empire—today’s games were chances to learn and improve. PoNY showed flashes of smart defense in the middle of the field and handler space and some fluency with pull plays despite lacking their soon-to-arrive large targets, but none of it was enough to get a win that would put them in the bracket. They also showed flashes of understandable frustration. PoNY coach Bryan Jones didn’t concern himself with roster holes today. He was focused on defensive adjustments and coaching his team into consistent efforts. Jones always has a critical eye trained on the little process improvements that, at season’s end, make the difference between barely missing the bracket and pushing ahead to quarterfinals at Nationals. This weekend is no different. At least this weekend, teams that have been eliminated from the bracket are in for a twist on the usual two placement games. Instead, USA Ultimate tournament staff will hand pick out-of-region matchups and work to avoid rematches from earlier in the weekend (or the season). That’ll do a lot for rankings connectivity down the stretch and could keep matters more interesting for the players. Comments on "Pro-Elite Challenge 2018: Day One Recap (Men’s)"